They were three blocks from the end of their round when they saw the viper-dragons. A full nest of them had gathered on the green of Mistfield Park: long thick-bodied serpents in bright metallic colors, some wider than a man and several times as long, others not even two yards from nose to tail. Half a dozen of the largest, in shades from sea-green to indigo, were slithering in a wide circle with a small orange-red one at the center. The back and ruff scales of all of them were raised in threat display, the red one coiled tight, head turning in a doomed effort to watch all the others at once. Perhaps a dozen other viper-dragons waited coiled at the perimeter, observing. Aunbrel started for the disturbance, but Kinsley caught his arm. "Not our problem, kid." "What are they doing?" Aunbrel hesitated, but his eyes were narrowed on the scene. "Dragon business. Not our problem." One of the large circling dragons snapped forward and back out in a motion too fast to follow, accompanied by the clashing rake of tooth against scale. The red one loosed a hiss of pain or warning, glaring at the assailant. Aunbrel's nostrils flared and he strode toward the scene. "They are in Hopestart, they are obliged to follow its laws." Kinsley hauled on the elf's arm. "They've got dispensation for their customs. They're not violating any laws." Aunbrel glanced sidelong at him. "This is a custom?" Another clash and a hiss jerked his attention back to the nest. "Among dragons. Yes. They're allowed. It's only assault if they draw blood. See? No blood." The red dragon's head lifted at Aunbrel's motion, looking past the larger dragons to stare at Aunbrel. Luminous orange eyes seemed to plead Help me. Aunbrel shook off Kinsley's hand and marched into the park. Kinsley trailed after, grinding out in a low whisper, "Not our problem." The observing dragons turned their heads to mark the tall elf's progress as he walked past them. At the edge of the circle formed by the largest dragons, Aunbrel stopped. "Is there a problem here?" The nearest viper-dragon, midnight-blue, at least eighteen feet long and two wide, coiled, twisting to face him, rearing up until the draconic head was several feet above the elf guardian's. "No problem. Not for two-legged folk." "Glad to hear it." Aunbrel tilted his head back to meet the midnight dragon's gaze. "I am Guardian Aunbrel of Hopestart, a keeper of the peace. As I'm sure you're aware, Hopestart's peace applies to all sapients of our fair city, regardless of number or lack of legs. Be they man, elf, felis ... dragon. So if there was trouble here for dragons ... "
The turquoise dragon next to the midnight one flicked out a tongue in warning at Aunbrel, scaled ruff mantling wider. "There is nothing here to concern you, Guardian." Aunbrel took three steps sideways, to meet the eyes of the small red dragon at the center of the circle of larger ones. "If there was trouble here for dragons," he repeated, "I'd be glad to help." The red dragon's bearing spoke of terror and desperation, but those orange eyes would not hold his. "No trouble," the little dragon echoed, in a voice haunted by hopelessness. Kinsley's hand gripped Aunbrel's sleeve; the elf didn't need to look to know what words the human was silently mouthing. Aunbrel's teeth ground together, but he forced them apart to say, "Good. Good. Because it's near the end of my shift." Aunbrel glanced about, then walked to a nearby bench and sat. "And if there's no problems here, why, my partner and I can take a break." Kinsley covered his face with one hand and shook his head, but took a seat at the far edge of the bench. Aunbrel waved a hand to the viper-dragons. "Please, don't let us keep you from your peaceable enjoyment of this public park." The dragons turned about, hissing at one another in their own tongue. Aunbrel had no idea what they were saying, although the hostile looks he was garnering were unpromising. The red one's eyes darted from the large surrounding dragons to the elf guardian and back again. After a few minutes, the dragons uncoiled and began to slither from the park. The largest ones herded the small one, keeping the little red dragon between them. Aunbrel grimaced, then leaped to his feet. "Ah, wait, just a moment." He stepped around and over the large dragons even as they reared back in anger at his intrusion. "It is not your place to interfere, two-legs," the midnight dragon hissed. "Right, I know, my apologies." Aunbrel raised a hand for patience and addressed the red dragon directly. "But I have just recollected that a dragon meeting your description is wanted for questioning. I am afraid I must ask you to accompany me back to the peacehouse." Kinsley cradled his head in both hands. "What is this about?" an indigo dragon demanded. "Burglary in the Merchant District. An orange-red dragon of about this length was sighted fleeing the scene." "It is not her," the midnight dragon said. "Oh, perhaps not, but that's not for you or I to decide. This way, miss." Aunbrel held out an arm to the small dragon, gesturing for her to follow him. She slithered up his arm instead, gliding higher to coil over his shoulders. Aunbrel checked his surprise as the giant viper-dragons seethed around them. Pretending that this had been his intention all along, Aunbrel put a hand on the red dragon's side to help her balance. The large dragons seethed and writhed around them, but Aunbrel stepped over and around them as necessary and the dragons were, apparently, unwilling to physically stop the guardian. Kinsley, peeking between his fingers at the scene, rose to follow on his partner's heels as the elf carried the small viper-dragon from the park. "Air and Fire! Have you gone mad, boy?" Kinsley hissed as soon as they were out of earshot of the rest of the nest. "What do you think you're doing?" Aunbrel wasn't sure either. "Keeping the peace." 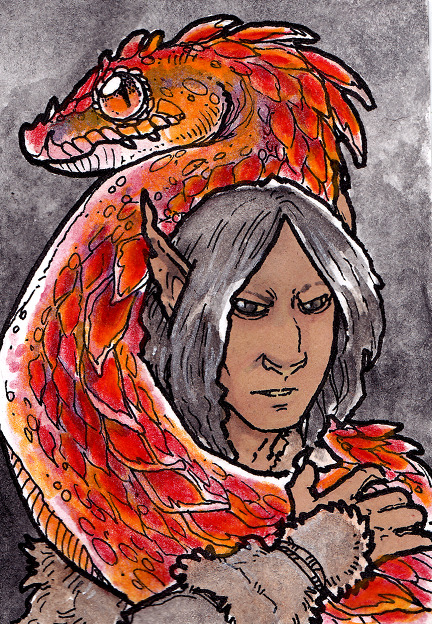 The viper-dragon was a heavy weight around his shoulders, coiled too tight and trembling. She dropped her chin to rest on the top of his head. "Is there really a dragon wanted for questioning?" "Yes." Aunbrel walked briskly. "Although I fear I will discover when we are back at the peacehouse that the description is not quite a match for you. Might have been tiger-striped in green and black, and five yards long. I apologize for the inconvenience." "Thank you," she whispered. "Will you lock me up?" Aunbrel shook his head. "Of course not." "Please?" she begged. "For the night? Lock me in a cell?" "Er ... " Aunbrel tried to decipher that request, giving Kinsley a pleading look. "Not for the burglary, surely?" Kinsley scrubbed at his face and heaved a sigh. He started to push back the cuff of one sleeve, then changed his mind and did it to Aunbrel's indtead. The old human held the elf's brown wrist to the dragon's face. "Bite him." Her head drew back, nictitating membranes flicking open and closed over her eyes. "I don't want to -- "
"Bite him," Kinsley repeated. "Hard enough to leave a mark, not hard enough to break skin. And by Fire's hells, don't poison him!" The viper-dragon slipped her head forward, glancing at Aunbrel for permission. The elf gave a little nod, and she closed her mouth around his wrist. "Harder," Kinsley commanded. Aunbrel winced, and the human said, "All right, that's enough." She drew back, leaving small tooth marks dented and red in his skin. "There, that's assault. We can arrest you for it tonight and dismiss the charges tomorrow. Fire and Air! I need a drink." Aunbrel was working another late night in the peacehouse, completing the case notes for the day's investigations. His partner not only disliked paperwork but was abysmal at preparing it, and as junior partner tradition dictated Aunbrel do it in any event. Aunbrel didn't mind; late night was the only time the offices of peacehouse lived up to the name. His uniform jacket was off and hanging from the back of his chair, shirt sleeves rolled back to keep them from smudging the ink. On the first floor the hubbub of the night's arrests and complaints continued, but up here all was still. Quiet enough that the soft pad of feet in the hall outside drew the guardian's attention from his task. He rose and stepped toward the open door. "Hello? May I help you?" A human woman in a golden headdress and elaborate fur robes, a jeweled staff in her hand, peeked through the doorway. A spotted leopard prowled about her feet. Aunbrel fell to one knee, dropping his eyes. "Bright Lady!" A fair hand touched his shoulder. Aunbrel's tan skin darkened with a flush that crept to the pointed tips of his tall ears, in mortification at being caught out of uniform by Commander Lisia herself, the leader of all Hopestart. But the gentle voice that said, "Rise, Guardian. There is no need for such formality," held no rebuke, only a hint of amusement. Reluctant, Aunbrel stood, eyes averted. With an elf's height, he towered over her, which only added to the sense of his own impropriety. He straightened his shirt cuffs self-consciously. "My apologies, Bright Lady." Commander Lisia waved off his words. "There is no wrong to forgive. Be at ease ... Aunbrel, is it?" His gaze jerked up to her face in a moment of surprise. Faint lines around her large dark eyes and at her mouth and jawline hinted at her age. Aunbrel dropped his head again quickly, giving an awkward nod. "Yes, Bright Lady." Her leopard sat at her feet, leaning against her leg and staring at him with unblinking eyes. The Commander took a step back, dipping her hand to scratch the leopard's ears. "It seems there's light in this office every night, Guardian. Is it always you here?" "Not every night, Bright Lady." A smile played on her lips. "Almost every night?" Aunbrel didn't know what to say to that. "I am only completing my work, Bright Lady." "And perhaps the work of one or three others as well?" The Commander shook her head, smiling still. "Your diligence is commendable, Aunbrel. Relax." He would have rushed into a burning building at her command, or faced down a rioting mob, but Aunbrel had no idea how even to begin to follow that instruction. "I appreciate your service to my city, Guardian. And perhaps it is unfair of me to ask one more thing of you, but I shall." "Bright Lady?" He raised his eyes to her lips, but no higher. "Don't let the work eat you alive, Aunbrel." She touched his arm. "If you do nothing but Guard, you will forget the why of it. Do not allow yourself to become isolated, with no one and nothing to return home to. Remember to enjoy your life and the world you live in. Else what is it all for?" "Yes, Bright Lady." Aunbrel had no idea how to follow that instruction, either, but there was no other possible response. The Commander patted his arm. "Good night, Guardian." With her leopard beside her, she withdrew from his office. In the corridor, she shook her head and sighed to herself as she left. Kinsley had been Aunbrel's partner in the peacekeepers since Aunbrel joined three months ago. Kinsley had been a Guardian for nearly thirty years, and no one would accuse him of working too hard. Not that he was corrupt, or bad at his job, exactly. Though Kinsley was lazy: he had a habit of splitting the two of them so Kinsley could take the shorter half of a patrol route, or sending Aunbrel to run errands or interview witnesses in inconvenient parts of the city. But that sort of thing had to be expected from a partner with seniority, and the old human had the insight and knowledge of law and regulation that one would expect from someone with his experience. If he left early every night to go drinking -- "You don't mind finishing up the casework, right, Aunbrel?" -- well, surely he'd earned that right. The two were walking their usual circuit through the Iron District, narrow cobbled streets winding past dilapidated warehouses and aging smelteries, walls and roofs blackened by soot. Kinsley's pale face was open and smiling. He tipped his hat to the occasional passing human woman, offered a casual salute to human men, and a nod to members of other races -- elves, dragons, an unescorted panther. Aunbrel's own expression was grim, mouth thinned beneath an aquiline nose. After a little while, Kinsley elbowed him in the ribs. "Elf boy, you need to lighten up." Aunbrel made an 'oof' sound and failed to lighten up. Kinsley raised a graying eyebrow at him. "What's eating you? Your dog take ill?" "Maybe you should start. Seriously, you look depressed even for you, and that's saying something." "Look in the mirror and you will be. You can't let the job get to you, kid. You work too hard." Kinsley slapped Aunbrel's back. The tall elf sighed. "That's what the Commander said." Now Kinsley raised both eyebrows. "The Commander was talking to you?" "Last night. I am using too much gaslight at the peacehouse or somesuch, I imagine." Kinsley laughed. "That'd be you all right. Look, it's been a quiet day. We wrap up this loop, why don't you come with me to the Drunken Scarab?" Aunbrel rubbed the back of his neck. "I could stop by after I finished the day's paperwork." The older guardian shook his head. "No no no. Just skip it. Take off early." At Aunbrel's look, Kinsley chuckled. "I'll let you in on a secret, elf boy: the paperwork's not going anywhere. You don't do it today, it'll still be there tomorrow. And the day after, and the day after that." "Yes, and there'll be more of it," Aunbrel said sourly. "Ah, you wait long enough, and some of it won't matter any more and you'll never have to do it at all. Don't give me that look, kid. I've been at this game longer than you have. Trust me, one night's not gonna kill any one." Kinsley punched his arm, and Aunbrel yielded with a nod. Fire unfolded the instructions and reviewed them. Or a hundred thousand species of beetles. The stars to the world. That sounds easy enough, Fire thought. Let's start at the end. Firestorms blossomed, to fall upon a vast corrupted city. The city sprawled in a wasteland of ruined civilizations. The firestorms rained down from moons -- no, great spaceships, which hung in orbit about a world of grey seas, frozen deserts, and very little life. The only screams come from that single city. But a hundred thousand artificial monuments and archaeological remnants were left behind in those deserts, in wrack upon those seas, in metallic debris in low orbit. The ships spread out and the firestorms with them, obliterating everything. Fire marveled at her creation. I wonder how it came to this? The silver web of time stretched backwards from the end. Fire stepped lightfooted onto it, and danced towards its beginning. She paused in the middle to watch the lives of people unfold when their civilization was at its height, vibrant with promise. She ran quickly from there to before the people existed, when the world turned without animals more complex than a microscopic cluster of cells. So quickly that she did not see the snarl in the silver web, the way it caught and pulled in places, the way the tug sent ripples up and down the fabric of the world, the way the tangle was growing. It's hard to get something right on the first try.